how sad did you get when your pet died? i have a green asian arowana who died last January of 2008. i was very sad for a couple of days because i think he was irreplaceable. His name is Goliath by the way. i bought him when he was just 6 inches long. it took me 3 years until he was finally 24 inches long. what i like about goliath is he actually behaves like a dog. most of our visitors are impressed when goliath will come to me and will let me rub his back literally like a dog for almost a minute before he swim. and what's the coolest part is that if he wanted you to look at him or if he wants to get your attention, no he will not jump, he will actually produce a humming sound that at first i thought was a ghost.lol. those were the times that i missed with my goliath. he is a fish but he behaves like a dog. i really miss him until now because i believe no arowana will behave like he once did. I've lost many furry and finned companions over the near 60 years I've spent on this planet and it always saddens me. Whatever the species, when you spend several years caring for them it's natural to miss them. We had one Plec for 10 years and I missed him as much as any of the dogs or cats. He too was quite a character. Your Goliath sounds a great pet and I'm not surprised you miss him. Do all Arowana hum? I've heard several species do but I've never heard one! The only noisy inhabitants of my tanks are the African Dwarf Frogs, The males 'sing' loudly and the first time I heard it, I thought there was something wrong with my filter! I've had the 5 of them for 4 years now so I know I'll miss them a great deal. My oldest animal is my 18 year old cat and although he's in very good health and still very active (for a cat, lol) I know it will break my heart when the time to say goodbye comes. Annmac if you could have just seen how my Goliath really growl and how he likes to be petted like a dog i bet you too will be surprised and will miss him too. my girlfriend wouldn't believe me at first but after hearing him humming like a dog who's angry and giving warning signs she was surprised because you can acutally here it at least 2 meters away from the aquarium. it's that loud. same as you i thought it was my filter. but i know it's not cause it's not constant. i even thought it was a ghost who is trying to scare me, but in the middle of the day?! unbelievable right. and one day i finally noticed that when i heard the sound, goliath is actually looking at me and i saw his gills somewhat opening. that made me realized that he is the one producing the odd sound. and the thing that i missed from him the most is when you stroke his back continously for about a minute he will just do the sound again but with matching shaking of the entire body like he is being tickled. he is at least 20 inches long so you could actually stroke him starting from the head to his tail. and i think he is already 3 inches thick. i missed him badly. I've lost several pets over the years and I grieved over them like I would for any good friend. You get unconditional love from your pets and you can't really say that about humans. I lost my pet, Shana who was a 13 year old pug back in February of this year. She was my constant companion and I love her dearly and always will. You can see a picture of her in my avatar. Although she is irreplacable, I did eventually adopt another pug who we named Sookie. She is very lovable, but has an entirely different personality than Shana. So although I know I cannot replace Shana, I found love for another dog who brings me great joy and smiles. that will actually make it harder. having another pet that looks the same as your previous pet. having to compare them is unevitable. having you to miss more of your previous one. i was very very sad. it made me ill for 15 days. i had a doberman . she was so much to us. i just cried so much and could not take food for many days, i fell ill after that. I so sorry to hear that neilchua. 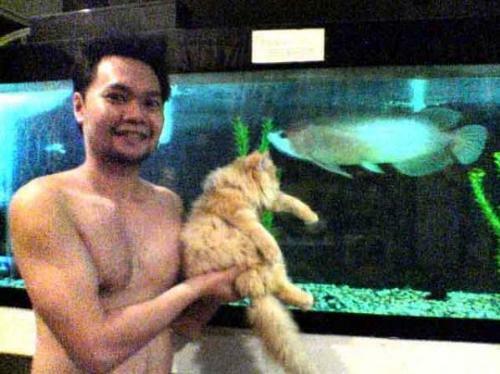 I am sure that your arowana has had a good life with you. I had a very bad experience when I was a kid. My family used to rear our own chicken. The was time I was very attached to a new batch of newly hatch "chicklings", I called them, they were so cute. I had them for about a month and they started to grow up fast. One day I let them roamed free for a while in the court yard, and my mom was busy with gardening at that moment. Then one of the "chickling" ran near my mom and she did not notice it and she stepped on the chickling, right in front of me. I cried for a few days, and I did not talk to my mom for a month. Well, I was still very young then, but the hurt is still there until today, I am in my 30s. Well of course I know its nobody's fault, but hey, it hurts, and hurts bad. well eventually they will end up in your own dirnner plate. i guess that will be a lot worst if you had to eat your own pet. because when we were still kids, my parents bought a dozen live chicks that we grew and ended up as our meal. it was really not appetizing. I can hardly answer this discussion without feeling the pain I did when I lost pets. It's amazing how close you get to them. I have a 15 year old dog at home, and it's going to be a really sad day when she's gone.